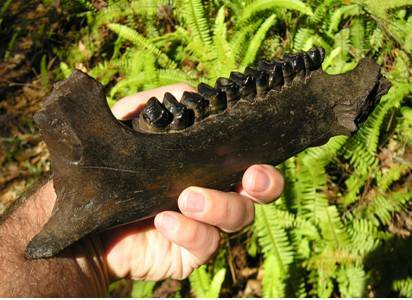 Fossil Tapirs are very abundant in the fossil record of Florida. 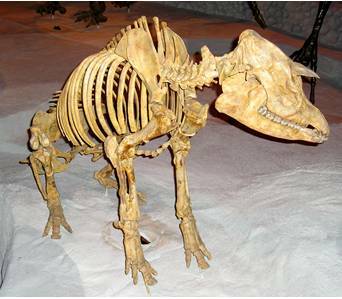 In fact, there may be more of these Prehistoric Tapir Skeletons found in Florida than any other place in the world. This is a primitive hoofed browser with a trunk-like nose. The short trunk is used to sniff out and guide vegetation into the mouth. In general, they look like a large dark pig with a small trunk. There are 4 species of Tapirs alive today, but most people are not too familiar with them, if at all. There nearest relatives are the horses and rhinos. On average, a Tapir is around 7 ft. (2M) long, 3ft. (1M) at the shoulder and anywhere between 330-770 lbs. (150-300kg). These robust primitive mammals have changed little in millions of years. This prehistoric mammal is a good swimmer that usually stays close to water to cool itself and avoid predators. This “living fossil” had hoofed toes, with 3 toes on the back legs and 4 toes on the front. They have evolved this adaptation over time and it gives them the ability to better walk in silt, clays and overall marshy ground. Appearing in the Early Eocene around 55 Million Years ago, this ice age mammal was a member of the Perissodactyls, or “odd-toed” ungulates. 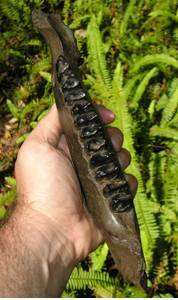 They have a full set of low-crowed teeth with distinct ridges, and chisel-shaped incisors. As the land bridge of Panama formed between North and South America 3 million years ago, it opened up a travel route for Tapirs to migrate into South America. Of the 4 modern types of Tapir, three species are in Central and South America, and one is in Southeast Asia. The type specimen of Tapirus veroensis was discovered at Vero Beach (Vero), Florida, and was named by E.H. Sellards, in 1918. Sellards was the Florida State Geologist at the time. 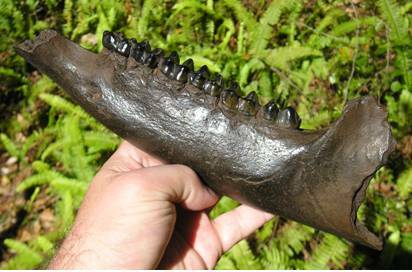 A virtually complete Fossil Tapir Skull of Tapirus veroensis was discovered. The specimen was thought to be rare at the time, but now is considered the most common species of fossil Tapir, in Florida. Tapirus veroensis species went extinct around 11,000 Years ago. 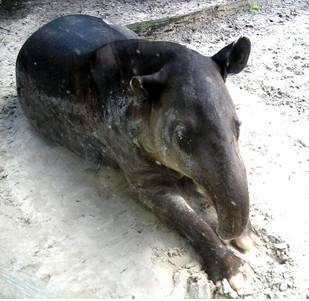 The oldest known Tapir from the fossil record of Florida is a lower fossil tooth that was discovered from the Early Miocene Period in Hernando County, Florida. 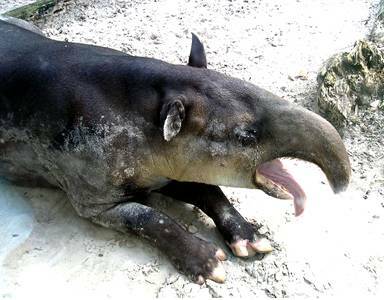 There are at the minimum, 6 extinct fossil species of Tapirus known to have lived in Florida. These are: Tapirus veroensis, Tapirus haysii, Tapirus lundeliusi, Tapirus webbi, Tapirus polkensis, and Tapirus simpsoni. - Click on each picture below to learn more.